FileBoss allows you to save the current tab layout to a file so that it can be recalled at any time. For instance if you have a set of tabs and tab groups that you like to use whenever you are working with you photo collection you can save that layout to disk and then, when you want to work on your photo collection again, just reload the tab layout. You can also assign tab layouts to shortcuts so that when the shortcut is clicked FileBoss will load with that specific layout no matter. 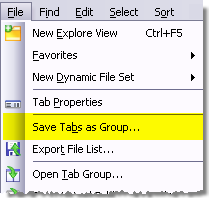 The default folder for saving tab groups is in My Documents\FileBoss Data but you can use any folder you want. 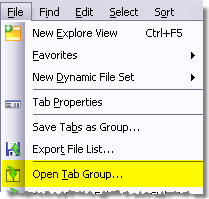 select a file in the File Open dialog. 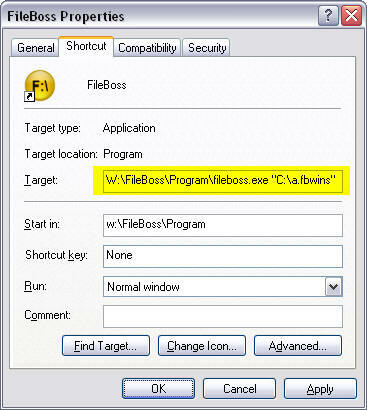 first create a shortcut to FileBoss (or just make a copy of the current one on the desktop or start menu). In the case shown below a layout was previously saved as C:\a.fbwins and this what has been entered as a parameter in the Target Field.